If you’re a frequent flyer, you might have experienced discomfort, popping, or in some cases, even severe pain in your ears, during the flight. And regardless of how much you pay for your tickets and what class you travel in, this is one thing that you’ve likely experienced more often than not. While ear popping and discomfort during air travel is pretty common for most travelers, it might get really serious for some people, even to the point that it causes permanent ear damage and hearing loss. So, it is important to take suitable precautions and prepare yourself before, during and after the flight. It all has to do with the difference in air pressure. The air pressure around us changes with altitude. When you’re moving along the same altitude, which is mostly the case under normal circumstances, the air pressure inside the inner ear matches that of the outside, so there is no cause for discomfort here. 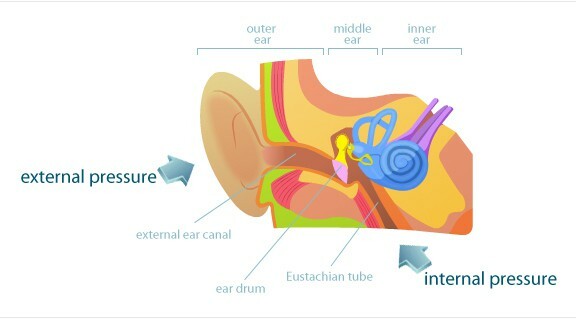 Even when you’re ascending or descending slowly (like when you’re climbing a hill), there is enough time for the air pressure inside the inner ear to equalize with that of the outer ear. But, if the outside air pressure changes rapidly (like when you’re in a flight right after take-off or just before landing), the inner ear doesn’t get enough time to equalize that pressure on the inside. During take-off, the surrounding air pressure falls more rapidly than that on the inner side of your ear. And this causes the eardrum to swell outwards. Alternatively, during the landing sequence, the air pressure outside increases rapidly due to the decrease in altitude, and the pressure inside the inner ear is lower. Consequently, the eardrum is sucked inward. Even though the internal cabin pressure is adjusted to minimize this effect, there is still a significant difference in pressure, which is why the issue persists. In either case (take-off or landing), the stretching of the eardrum causes pain. During this time, the eardrum is not able to vibrate (as it is already stretched), causing decreased hearing and muffled sounds too. The effects of change in air pressure vary among different individuals and in different situations. For example, if you’re traveling with a blocked nose, there may be a lack of air flowing through the passage between your nose and your inner ear; thus reducing the air pressure in that particular region. In this situation, even the normal cabin pressure may be significantly higher than the pressure within your inner ear, causing the eardrum to be stretched inwards, leading to discomfort, and in extreme cases, severe pain. To minimize the ear pain and discomfort caused by air travel, one needs to take certain precautions before, during and after the journey. In order to equalize the cabin pressure with that of the inner ear, one needs to let in enough air through the eustachian tube. EarPlanes are a patented pressure-regulating earplugs which help reduce discomfort usually associated with air travel. Developed by Cirrus Healthcare Products LLC in association with the House Ear Institute in Los Angeles, the product has been tested and approved by US Navy pilots. This product consists of two elements — a hypoallergenic silicone ear plug, and a ceramic pressure regulator. 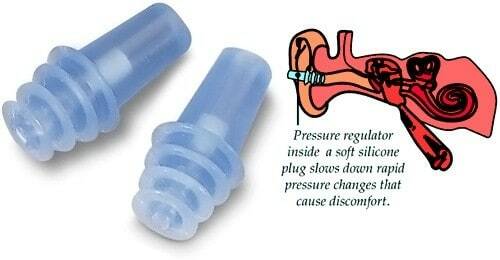 The silicone earplug has four circumferential rings to provide an airtight seal between the EarPlanes and the ear canal. The ceramic element is a controlled porosity filter with one end exposed towards the external cabin pressure, while the other end faces the sealed chamber that is created by the silicone part of the product. The ceramic element acts as a filter that controls the air flow in and out of the ear canal, by exerting an equal and opposite impedance on the exterior of the middle ear, allowing relief. Additionally, EarPlanes also function as noise suppressing ear plugs. It seems to automatically filter out the undesirable high frequency noise generated by aircraft engines. At the same time, on-board announcements made through the aircraft’s PA system may still be heard. It is to be noted that the EarPlanes are recommended to be disposed after two or three round trips. This is because, the porous ceramic filter may eventually trap air particles and impurities, which, in turn, reduce the effectiveness of the product. Given that the product costs around $10 – $25 (depending on your location) for a single pair, and the fact that it is disposable after a few rounds of use, it is important to account for your budget (among other factors) when you consider investing in such a product. Factors like your current health, the cost of your travel and duration of your flight should influence your purchase decision. If you’re healthy and have paid less than $30 for your flight ticket, or if the duration of your flight is less than an hour, it doesn’t make much sense to invest in EarPlanes. On the other hand, if you’re suffering from cold and compelled to travel, having a pair of EarPlanes is a huge plus. Also, it is a good idea to open your EarPlanes packaging on the flight just before take-off, to prevent early contamination of the ceramic filter. Note: EarPlanes are one of the most popular pressure regulating ear plugs available, though they aren’t the only ones in the market. You might also find other similar products, which are cost effective and work quite well in reducing ear pain. All that being said, EarPlanes isn’t the only way to manage ear discomfort or pain during air travel. There are several preparations or procedures you can try in order to minimize ear discomfort. Take a decongestant about 24 hours before flying to keep the air passages and ears clear. Swallow, chew gum, yawn or drink fluids. It stimulates the muscles surrounding the eustachian tube, and keeps it open for normal functioning. Try the Valsalva maneuver. This helps to unblock your ears when pressure starts building up. With a mouthful of air, close your mouth and pinch your nose shut, and gently force the air out until your ears pop. Note that this maneuver isn’t recommended if you’re suffering from cold or allergies, as it may lead to severe ear infection. In that case, try the Toynbee maneuver instead; close your mouth and nose, and swallow several times until the pressure equalizes. Use a nasal spray one hour prior to landing, and only as needed. Overuse of nasal sprays may cause more congestion. Try not to fly when you’re suffering from cold, nasal congestion, sinus, or any other form of upper respiratory infection. You’re more likely to experience ear problems in such cases. If you have an allergy, take your allergy medication as a precaution one hour before your flight. Refer to this page for more suggested ear clearing tips. We hope this article was helpful and informative. If you’re a healthcare professional and have additional tips for air travel, you can share them in the comments below.